Shadow Treasurer Chris Bowen has said the Labor Party will not accept any further delays to increases in the Superannuation Guarantee rate. “Let me make it clear that the Labor Party does not regard a 9.5 per cent SG as providing adequacy – we will brook no further delay to the legislated timetable,” he told the AFR Wealth & Banking Summit. Mr Bowen didn’t say if Labor would increase the SG rate faster than is currently legislated, instead criticising the Coalition for past, and potential future, delays to SG rate increases. Under a timetable legislated by Labor, the SG rate was going to reach 12% on 1 July 2019. However the Coalition delayed the increases, keeping the SG rate at 9.5% until 1 July 2021 and not reaching 12% until 1 July 2025. “Just last week I mentioned my concerns about the government reneging again on the current 12% superannuation guarantee schedule,” Bowen told the conference. “And yesterday I read that the Government is indeed considering further delays to an increase in the SG as we see new “confidential Treasury modelling” suggesting aged pension costs will be less than expected under existing policy settings,” he said, seemingly referring to a report in The Australian. Treasurer Josh Frydenberg has told The Australian that the Government has “no plans” to change the SG rate reaching 12% in 2025. 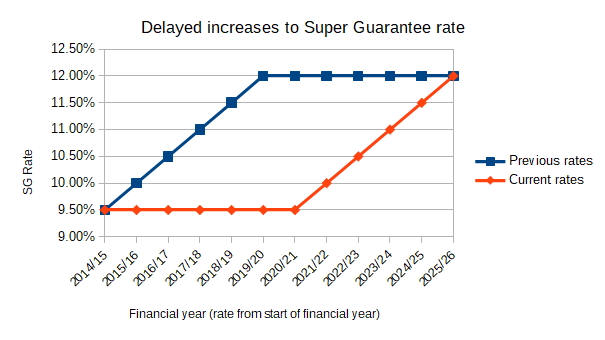 Labor has often been critical of delays to increases to the SG rate, but hasn’t set out an alternative timetable. The Labor party platform doesn’t set out a timetable for increases to the SG rate, instead saying Labor will “urgently prioritise this objective by ending the freeze and increasing the Superannuation Guarantee to 12 per cent as soon as practicable”. $36,000 for the median superannuation balance at retirement of men compared to women. He reiterated the policies announced last year – to gradually remove the $450 threshold to receive Super Guarantee and to pay SG on Paid Parental Leave and Dad and Partner Pay payments. This article has been updated to reflect the comments by Treasurer Frydenberg.